Puerto Rico: the Island of real estate opportunities. Oceanfront, beachfront, surrounded by golf courses, Puerto Rico has it all. Following the economic downfall that left a hurting real estate industry, the Island now provides extraordinary opportunities for both for first and second home properties. But the scenario is even more attractive when you add the incentives that are provided by both government and developers to reactivate the industry, which include rock bottom pricing, no property taxes for 5 years and very competitive rates for financing. 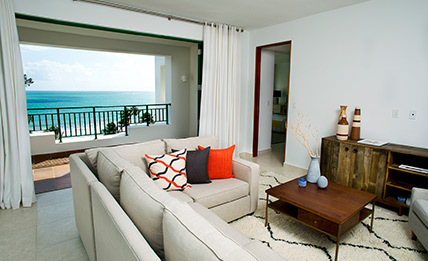 While the market is slowly recovering and the absorption rate for properties continues to improve, one of the properties that stands out is Ocean Sixteen, a very private oceanfront condo, set in the beautiful Río Mar Beach Resort & Spa –a Wyndham Grand Resort, just 30 minutes away from the capital city, San Juan. The property is set facing the ocean and the iconic 16th hole of the Fazio-designed Ocean Course in Ocean Sixteen. It enjoys all the excellent amenities of the resort, including miles of sandy beaches, two world-class golf courses, an International Tennis Center, Mandara Spa and Fitness Center, over 12 restaurants, lounges and entertainment venues, a thrilling casino, and quaint shops and boutiques, among others. Río Mar is one of the most coveted resort communities in the Island, with a tradition of quality of life, great entertainment and sense of community. Once in Ocean Sixteen, privacy is one of its most coveted assets. It enjoys a private entrance with 24/7 access control and security, plus its own amenities, including an infinity pool facing the ocean and a kid's pool, plus a private Owner's Lounge, a spacious and fully furnished area with a flat screen TV, pool table, bar, and a private wine cellar with a tasting table, which is a centerpiece of life at the community. The properties have 2 and 3 bedroom condos. At a time when Act 20 and Act 22 are attracting investors and businesses to Puerto Rico, Ocean Sixteen provides a great opportunity to live the resort lifestyle of the Caribbean. Also with Law 68 potential buyers can purchase new residences, without paying property taxes for five years, and without capital gain taxes, among other benefits. For more information call 787-593-9949.